The Hours I Spend Stuck in Traffic Are Bad for My Health. But Along the Way I Get a Front Seat View of Southern California’s Transportation Transformation. Since I started driving from my South Pasadena home to my Santa Monica office by way of Arcadia (which isn’t on the way) and back, I’ve spent between three and four hours a day commuting. Studies show that long commutes take a toll, and that’s borne out by my own health and habits: I’m more tired but still find it harder to fall asleep. I exercise less and spend less time with my kids. I’ve gained 10 pounds in a year when I needed to lose 20. But in an odd way, my awful commute leaves me hopeful. Because every day, as I make my long, slow drive—first nine miles east to my kids’ preschool, then a U-turn and 34 miles west across most of central L.A. to the offices of Zócalo Public Square, where I’m a columnist and editor—I get to see the daily progress of Los Angeles’ transportation transformation. Along my miserable drive, there are many signs that my commute will get better and healthier—very soon. It’s important to stipulate that while many Californians hate our long commutes, such commutes are sometimes the byproduct of love. I love living in a strong community with great schools that is less than two miles from the Pasadena house where I grew up. I love my kids’ preschool in Arcadia, the only Jewish preschool in this part of the San Gabriel Valley, which has come to mean a lot to me even though I’m the only member of my nuclear family who isn’t the least bit Jewish. And I love my job, even though it is in a gridlocked section of Santa Monica. I feel very comfortable in all three places—it’s just shuttling between them that’s uncomfortable. But all this travel does hold glimmers of promise. I start by strapping my two older boys, 5 and 3, into their car seats in the back of the Prius (a godsend for gas savings), and head north to pick up the 210 Freeway East. The boys love this leg of the trip, because they can see the Metro Gold Line—the light rail that runs from Pasadena to East L.A.—as it winds its way north through South Pasadena and Pasadena before turning right and going down the middle of the 210. They love competing to see who can count the most trains; eight is usually the winning number in the 15-minute drive. 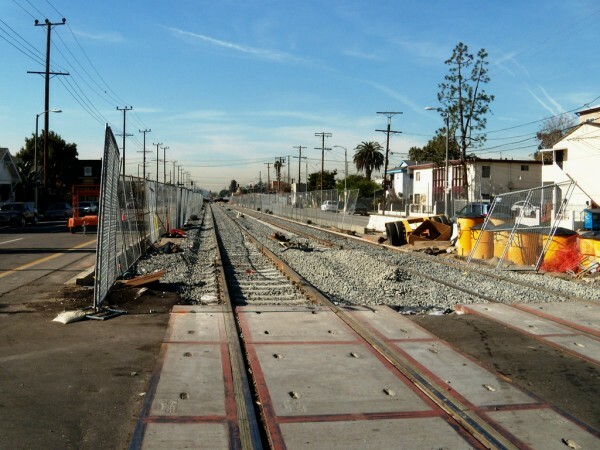 For me, the best part is where the Gold Line ends at the eastern edge of Pasadena—and the construction begins. The Gold Line is being extended all the way to Azusa, one of five new rail projects underway in L.A.; we pass the first new stop in Arcadia’s little downtown, near the Santa Anita Racetrack. Every day, I watch workers lay more track down the middle of the freeway. Earlier this year, I marveled as they built a bridge over Santa Anita Avenue in just one week. The full 11.5 mile extension is supposed to be completed by September 2015, encouragingly soon. Once I’ve dropped the boys off, I head south, cutting through the city of El Monte—and by El Monte’s airport, full of little planes—to pick up the Santa Monica Freeway, the 10 West. (One day when traffic was especially bad, I stopped and walked into the airport to ask how much it would cost me to fly to Santa Monica; a pilot explained that the fuel alone would bankrupt me.) I pass the beautiful new El Monte Station, a point of convergence for a dizzying array of buses, trolleys, and shuttles. There’s space for a bike hub, and also new express buses that could get me to downtown L.A. in just a few minutes if that were my destination. Unfortunately, it isn’t. So I get on the 10, which is usually jammed. But that’s not a problem for me. I have a transponder that allows me to use the Metro ExpressLanes, the controversial “Lexus lanes” that charge drivers anywhere from 25 cents to $1.40 a mile, depending on the time of day. Most days, I pay, rationalizing that I’m transferring the gas money the Prius saves me to Metro to improve their services. Studies have raised questions about how much time is saved by the lanes, but, merging in shortly after 9 a.m., I save more than 20 minutes. I’m glad Metro recently made the lanes, which had been a one-year pilot, permanent. I ride the lanes all the way to their conclusion downtown at Alameda. There on my right is Union Station and on my left is Little Tokyo, where a new regional rail connector is being built so that the Gold Line, which has a stop six blocks from my house in South Pasadena, can connect seamlessly with other rail lines that will eventually take me to the southern and western edges of the county. I jump on the 110 Freeway through downtown, then get back on the 10, and battle the merciless traffic to Santa Monica. On the way, I can catch a glimpse of the extension of the Expo line, which now ends at Culver City, but by the end of next year should go all the way to Santa Monica, just six blocks from my office. Today, when I get off the 10 in Santa Monica, I have to cross through the construction of the line’s end along Colorado Avenue. Most days, it’s about 10 a.m. when I arrive at the office; I leave the house a few minutes after 8. In the late afternoon, I repeat the journey, in reverse. It’s brutal, but I can literally see the possibility of a better commute out of the driver’s side window. By early 2016, I may be able to walk or bike to a Gold Line train—either near my house or after preschool drop-off—and ride to work. If the trains are reliable and on time, I’ll save gas and stress and have more hours to devote to serving you, reader. Look for me—I’ll be the guy writing this column on the train.